The following annex is part of the general terms and conditions that govern all online offers, sales and purchases through the website(s) currently located at shop.zeiss.co.uk (together with any successor site(s), the "Site"). g. UK WEEE Regulations means the Waste Electrical and Electronic Equipment Regulations 2013 (as amended) which implement the WEEE Directive in the United Kindgom. b. from 15 August 2018 to all EEE, unless excluded in article 2 (3) of the WEEE Directive. 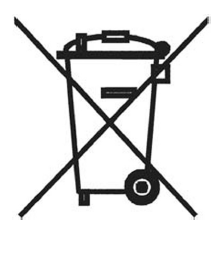 e. the meaning of the crossed out wheeled bin symbol shown below. 3.2. Note, pursuant to regulation 51 of the UK WEEE Regulations, Producers and Distributors are prohibited from showing to a person purchasing EEE otherwise than in the course of a business, at the time of sale of new EEE, the costs of financing the collection, treatment and environmentally sound disposal of WEEE from private households.